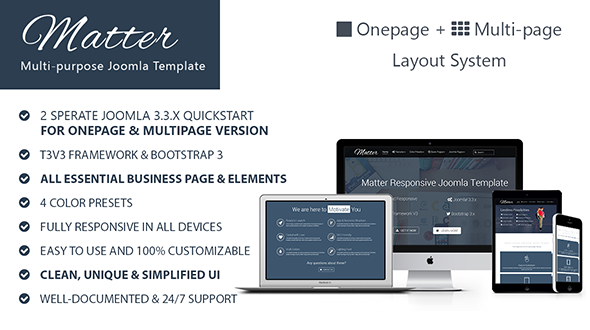 Matter - is a Multi-purpose, Clean, Super-flexible and Fully Responsive Joomla! 3.3.x Template. Which is perfect choice for any kind of Onepage & Multipage Business/Corporate, Agency and Portfolio Websites. It comes with Onepage and Multipage Version Including 2 Quickstarts so, you can create your Onepage or Multipage site within minutes. Matter built-with Most Stable and Powerful T3V3 Framework including all Business Pages and Cutting-edge Features.